Pennsylvania’s ARGUS stormed onto the underground metal scene with their twin guitar-driven, doom-tinged, working class metal sound. Releasing a self-recorded demo in early 2007 on John Brenner’s (Revelation/Against the Nature) DIY label, Bland Hand Records, the band was roundly welcomed by the metal community at home as well as abroad and established its foundation amongst friends/fans within the scene. With this initial momentum, the band created a buzz that was only solidified by their punishing live performances. Their self-titled debut album was released in 2009 receiving much critical praise. The band continued to gain notoriety attracting like-minded fans word-wide who celebrate the genre and its core values of: hard work, discipline and integrity. 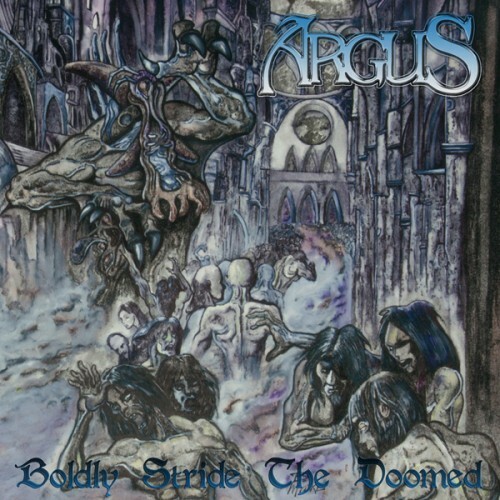 Featuring the powerful voice of former Penance vocalist Butch Balich, Argus prepares to cement themselves within the metal archives with its sophomore effort, “Boldly Stride the Doomed” ! Order together with "The Doomed" t-shirt and save 4,00€ (check RELATED PRODUCTS) ! Features two exclusive bonus tracks on a dedicated side of the second LP, ARGUS' personal ren..
Limited to 500 copies, this DVD features ARGUS performance at the Hammer of Doom V festival (16/4.. THE OBELISK.NET - ALBUM OF THE DAY “Beyond the Martyrs finds a progressive balance betwe..
Draped in a warm, crystalline production job, “From Fields Of Fire” is kicked off by .. AVAILABLE IN REGULAR BLACK AND LIMITED RED/WHITE SPLATTER VINYL! FEATURING 4 BO..